Has the story of human evolution moved beyond “survival of the fittest?” What if instead of seeing humans as ultra-competitors, we saw ourselves as an ultra-social, super-cooperative species? 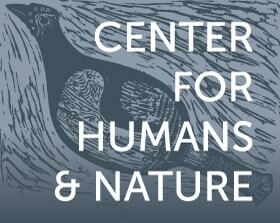 Join us as we examine human morality through the lens of evolution. Read our contributors' thoughts as they explore the biological and cultural foundations for the development of morality, and share your own ideas on the roots of morality. Watch videos from our special live event, Love + Evolution, in partnership with Wisconsin Public Radio's To the Best of Our Knowledge. Chimpanzees are in many ways highly cooperative. 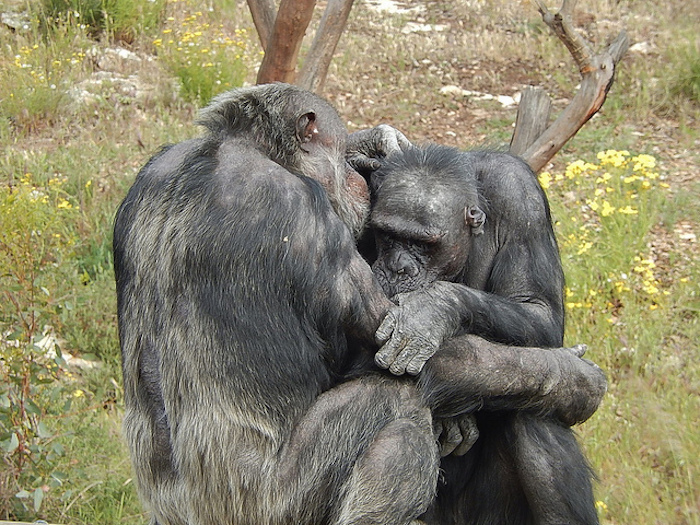 Chimpanzee “friends” support one another in fights and groom one another to remove lice and other vermin. In appropriate circumstances individuals will help their groupmates fetch out-of-reach objects, and sometimes even share food with them. But chimpanzees are not moral in the human sense of individuals self-regulating their behavior by a sense of the right and wrong ways to treat others. Thus, despite our moral concern for them as living creatures, we do not allow them to roam freely in our midst for fear they will attack our children, steal our food, destroy our property, and generally wreak havoc without regard for anyone else. And if they did all of these terrible things, no one would blame them or hold them responsible. Why not? Why are they not moral in the human sense? The sacrificing for others, you > me motive became especially strong in early humans because they were especially interdependent with one another. If the only way I can get food is by teaming up with you, then if you are hurt or ill I had best do everything I can to help. And in a marketplace of partner choice, with many potential partners, I had better make sure that others perceive me as a cooperative partner as well—otherwise I will starve. We care for each other—and about what others think of us—because we are interdependent. The equality with others, you = me motive is even more clearly moral as it is not about ensuring my own long-term survival. The point is that as early human individuals collaborated with a partner toward a common goal, they understood that each of them was equally causally responsible for the resources produced—neither could have done it alone. Moreover, as they engaged in a particular collaborative foraging activity repeatedly, for example, hunting for antelope, they understood that for their mutual success each had to play their roles adequately. Each role thus had mutually known standards that applied to anyone in that role; they were impartial. In this context, early humans developed a sense of collaborative partners as equally deserving of the spoils: we who collaborate together treat one another (as opposed to free riders) fairly. The subordination of self to the collective, we > me motive reflects the Rousseauian insight that in interdependent collaboration “we” judge each of us. When we agree (make a joint commitment) to hunt antelope together, we each agree at the same time to play our role the way we both know it should be played. If one of us slacks off, the other will call him out on it. The slacker cannot just blow off the criticism because she herself believes the criticism is legitimate; we agreed at the time of the joint commitment that this is how we should do things for our mutual success (and she will be shunned in the future for not keeping to the commitment). When I do break my commitment, I feel guilty precisely because I believe the joint commitment is legitimate and that my equal partner does not deserve to be treated this way. In A Natural History of Human Morality, I argue that in the process of moving to a more cooperative, interdependent lifestyle humans developed these three non-selfish motives. And then came the move to cultural groups in which the interdependent “we” was everyone in my tribe, which did not include others in the out-group. Humans did not become moral angels during this process, but there did come into existence a moral option—what is best for us, however defined—that might be chosen. But it is not always clear what is the moral option; moral dilemmas are all too real. Moral dilemmas exist because human morality is not a homogeneous set of rules that automatically apply everywhere, but rather a motley of social propensities that humans have accumulated over hundreds of thousands of years aimed at promoting “us,” as defined in various ways. If we now ask whether morality is serving us well in the contemporary world, with all of its cultural and political complexities, the only evolutionary answer is: we are still here. Whether we will be here much longer depends, it would appear, on whether all of us earthlings choose to conceive of ourselves as a “we,” working together for mutual benefit. Michael Tomasello is Co-Director of the Max Planck Institute for Evolutionary Anthropology, Leipzig, Germany, and Professor of Psychology and Neuroscience at Duke University, Durham, North Carolina.